How green can a chess set actually get? Over the last few years the developed world has become obsessed with environmental issues. Not a day passes without something coming on the TV or radio about global warming and the effects it is having. The whole carbon output debate rages on but while the scientists search for definitive answers the rest of us seem to be keen to ‘do our bit’ to help our planet. Why are we even talking about this on a bog about chess sets? That’s a good question, slide back in time a decade and the two subjects would have seemed totally irrelevant. But the world is changing, while large supermarket chains spend millions telling us how much carbon has been produced in exchange for our loaf of bread the consumer is aiming their dollar at the most environmentally friendly outlet. Indeed how can one begin to assess the environmental affects of a chess set? What wood is it made from? how many miles has it traveled to get into my hands? The issue of the wood used is one point in case. Ebony chess pieces for example, are these really going to have much of an environmental impact? Greenpeace have a website dedicated to endangered woods that lists the types of wood used a lot in the production of musical instruments, in particular stringed instruments like guitars. They list ebony and rosewood as two of their endangered woods. They even point out that india, where many of the worlds best chess sets come from, has having seriously depleted it’s stocks of ebony. Lets be reasonable though, one has to bear in mind that many fine chess pieces are hand carved over a period of hours and days. The price indeed reflects this. By it’s very nature chess piece and board making does not lend itself well to huge scale mass production. While most of the chess products continue to be hand made the constraints on output will remain. Already the guitar collecting fraternity have started to pin high price tags on certain models that were made in times before certain woods became endangered and prohibition was put on it’s harvest. One notable case being the use of Brazilian rosewood on the fingerboards of guitars, great for tone, not for the planet according to some. Lets hope none of the guitars at the live earth concert had ebony or rosewood fingerboards, can’t teach the world to sing on a guitar made from endangered wood now can we? We also have the issue of transportation to think about. Most of the best chess sets come from India, with such a vast array of importers and retailers and indeed some chess retailers importing their own stock many of the imports are flown in as opposed to sea freighted. The retail prices of the chess sets in developed western countries more than covers the air fair. How much of the price you pay is in fact it’s air ticket? So what will the future hold for chess set production and the kinds of woods we can expect to see our pieces made from? Will the day come when the value of ebony chess pieces follows the plight of the vintage guitars? 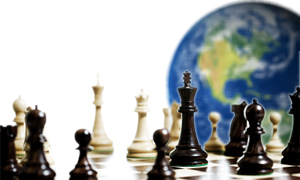 Will we see a carbon sticker on the packaging of imported chess sets? Only time will tell. This entry was posted in Chess sets & the environment by chessblogger. Bookmark the permalink.